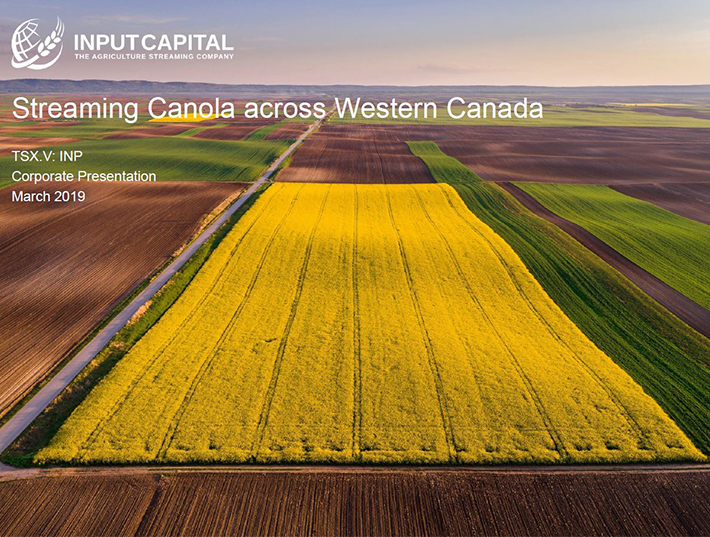 REGINA, June 28, 2017 /CNW/ - Input Capital Corp. ("Input" or the "Company") (TSX Venture: INP) (US: INPCF) announces it has received a Grain Dealer licence from the Canadian Grain Commission ("CGC" or the "Commission") and is now licenced and bonded by the CGC. The Grain Dealer's licence recognizes Input as a buyer of western Canadian grains and oilseeds and indicates that the Commission has approved the format and content of grain receipts and documentation provided by Input to its farm clients. In addition, the licence also includes a security bond, which provides farmers with peace of mind in their dealings with Input. "As our streaming portfolio grows and evolves, Input is becoming more and more like a different kind of grain company – one that does not own physical assets," said President & CEO Doug Emsley. "This evolution both required and made it advantageous for Input to become licenced and bonded by the Canadian Grain Commission, increasing Input's credibility and profile within the western Canadian ag marketplace. The licence provides an additional level of assurance to farmers and other industry participants that Input's systems, processes and documentation meet industry standards, as well as the certainty of receiving payment for final crop sales that is offered by the bonding process."